Optel’s Quality Management capabilities allow customers to gain full control over their processes and improve quality. Optel implements an intelligent process control to defect prevention and reduction of post-reflow PPM. The principle defects are identified using Pareto charts from one of the defect detection operations, such as solder paste inspection or AOI. Real time control charts are used to alert early deviations in process capability and prevent defects. 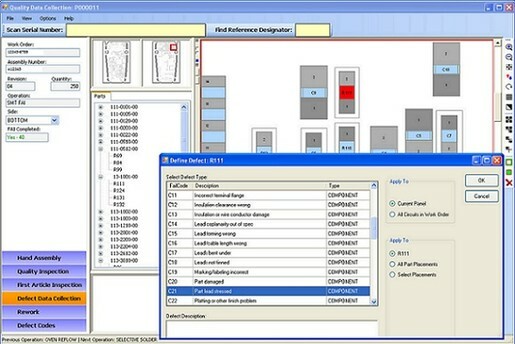 A feedback strategy is then implemented with the paste printer or placement machines. Optel’s Quality Management Module permits automated and manual collection of defect information, defect code management, yield calculations, first article inspection data, and alarms. A defect automatically collected from a test machine is further defined and its correction described using this module. A graphical board layout is used to support defect data collection and first article inspection. A textual and graphical description of the defect is saved into Optel database. Capabilities are provided for capturing defect inputs from quality inspections and repair, and for defect tracking. Defect input parameters can include status, defect type, part number, reference designator, operation step, quantity, time, and placement. Yield data can be collected and displayed for post-reflow visual inspection operations. Yield results can be viewed by work order, assembly part number and revision, and can provide statistics for total assemblies, passed, failed, scrapped, balance, and yield percent. Support for first article inspection includes details for each component part number, package, manufacturing install operations, quantity and graphical board location diagrams. Repair, rework and RMA are also supported. Real time quality tracking allows to reach to quality issues when they appear. Real time trend tracking and feedback takes operator our of quality loop. Alarming on trend charts allows you to take action when yields fall to unacceptable levels. 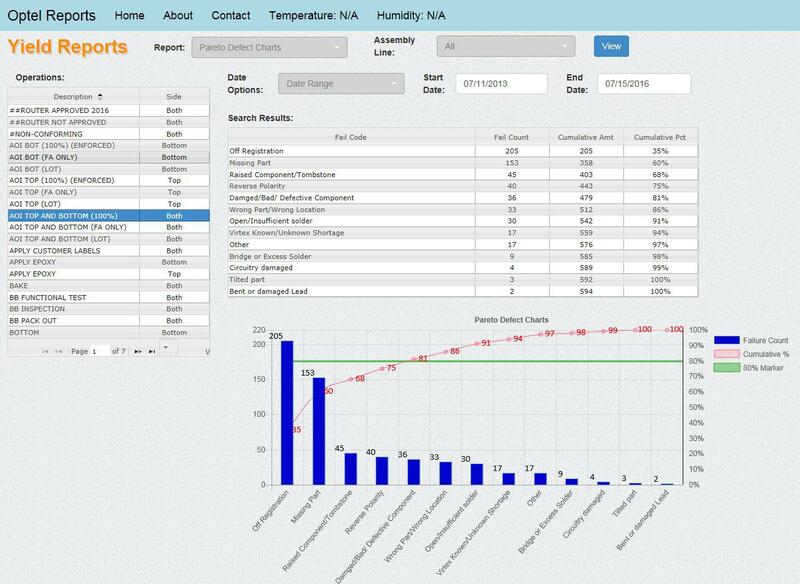 Alarming on Pareto charts allows you to alarm down to the individual component level. An alarm condition can be set if an individual component fails x times out of the last y runs of boards.